The chronic drumbeat within the service sector — the need for more qualified technicians — is getting even louder as boat systems grow in complexity. The Association of Marine Technicians is entering its 10th year of supporting technicians nationwide with training. Joe DeMarco, the group’s president, is a staunch advocate of better pay for those technicians. Although the stagnant economy has thinned the technician work force and stifled funding opportunities for increased training, an encouraging development is taking shape in Wareham, Mass., on the north shore of Buzzards Bay. That’s where John Bernier and Steve Lawrence last year launched North Atlantic Marine Services in a former car dealership. Bernier and Lawrence have more than 50 years of combined experience in the industry and are tech instructors at area vocational schools. Acting independently, they created the Amtech-authorized Northeast Regional Training Facility, which is endorsed by the Massachusetts Marine Trades Association and the Cape Cod Marine Trades Association. The goal is not only to bring advanced training to Massachusetts, but also offer an entry-level program to help train the next generation of marine technicians. The school held its first sessions in January, and 60 technicians from New Jersey to Maine enrolled in the advanced course. 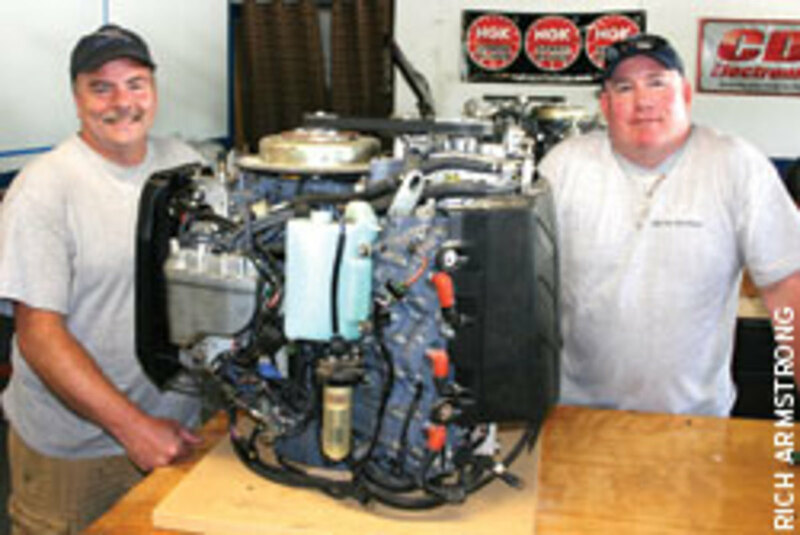 “We had Amtech send us instructors from various marine engine manufacturers to provide us with up-to-date information on the engines we have today,” says Lawrence, 51, who notes that MerCruiser donated five engines for a session on fuel injection. The school’s entry-level certificate training program consists of four segments totaling 450 hours over a nine-month period. The course is designed as a night school for boatyard workers who want to improve their skills and career-changers who want to become technicians. The same 450-hour program is also offered in a “fast track” session held from 9 a.m. to 5 p.m. on consecutive weekdays for three months. Amtech awards a basic technician certificate upon successful completion of the program. The skills-based learning incorporates information from the Marine Industry Technical Education Council, which provides a framework for what a technician should know. “This is our education guide,” says Bernier, who also is 51. “You can have countless certificates, but the bottom line is: Can you fix the boat?” Lawrence says. “Turn-Key-Go-Boating” — a phrase the team developed — is what they try to teach. “That’s what the customer pays for in this industry,” he says. The comprehensive training includes systems — propulsion, electrical and others — as well as spring commissioning, long-term storage, and hoisting, hauling and trailering. Students also learn about such skills as customer relations, budgeting and estimating jobs, employer-employee relations and professionalism. The goal is to enable them to understand what it takes to operate a profitable marine business. “We’ve had countless people tell us we’re the best teachers they’ve ever had,” Lawrence says. Students are often taught on engines and boat systems donated through the Amtech organization and by manufacturers. Most engines are well used, which is preferred because that’s what technicians will encounter on the job. A key to their teaching style is to not simply give students answers. They will help a student work through a problem, troubleshoot it, take something apart, “and then have the student explain what they see and why they feel this is the cause,” Lawrence says. The reasoning is that students learn better, retain knowledge and become better technicians that way. Understanding how systems work and applying a diagnostic procedure results in a “marine technician with the critical thinking skills that are needed on all vessel systems,” Bernier says. As an example, a boat with fully functioning water systems sits front and center in the lab area to serve as a learning platform. Equipment on board is made to fail, and students must figure out how to get it working properly. “We teach failure analysis and troubleshooting — what went wrong so it does not happen again,” Lawrence says. Amtech believes in cross-training the work force on profitability and customer service. Both instructors agree that the marine industry cannot afford to lose another customer because of poor service or a “that’s the way we always do it” attitude. “Everything is customer service now,” says Lawrence. The job of technicians and yard managers has “turned 180 degrees” during the last decade as more information has become available on the Internet, he says, and it’s their job to provide accurate guidance. “Now customers come in and they know exactly the part they need,” Lawrence says. But it’s just as important that a technician be trained well enough to counter bad information a customer found on a blog or online forum. “There is information overload on the Internet and technicians need to know exactly how systems work,” he says. North Atlantic Marine is not only about training. The crew also operates a repair business during the summer months. This keeps them “harpoon sharp” in the types of repair problems the industry is seeing, Bernier and Lawrence say. The official policy at North Atlantic Marine is “boots on your boat within 48 hours,” which means a marine technician will be on board and diagnosing a problem within that time. Summer in the Northeast is too short for long delays. “How do we exceed your expectations as a boater is what we preach to our students,” Bernier says. Potential students can visit www.namarineservices.com, www.am-tech.org or call North Atlantic Marine at (508) 858-0606.